Mr. S… eating grin, New York’s Senator Schumer, came clean after the November 4th election or did he. The Democrats took a whupping across the board, one for the ages, a clean sweep for the Republicans. 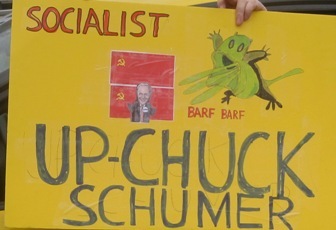 But Mr. Up-Chuck was in no mood to accept responsibility for the loss, he blamed the catastrophe on Obamacare. Said, we should not have concentrated on it (Obamacare)going into the 2010 election cycle; the economy was going through turmoil and our constituents were in dire condition, the focus on Obamacare was wrong, we needed to focus on their plight, helping them to enter the main stream, but we didn’t and the results showed. We were given the exit. Of course anyone with a half a brain realizes that Harry Reid’s kissing cousin is more of a blowhard than a truth teller. A life long politician with only one goal in mind, patronizing the left if it suits him or jumping ship when a tsunami is bearing down hard. In the next election cycle, New Yorkers would be wise to take the Senator out to the back forty for the kind of Whupping that Mary Landrieu will receive on December 6. Adios Senator.